Between June 7th and 15th, 2007, five years ago this week, a battle raged in Gaza for control of the lives of its more than 1.7 million inhabitants, 1.7 million people trapped in a narrow strip of land twenty five-miles long and just over seven miles across at its widest point. In the Palestinian National Authority elections the previous year Hamas had won enough seats to form a government on its own, but when faced with the threat of heavy sanctions from the US and the EU who considered Hamas to be a terrorist organization, a Saudi-brokered deal resulted in a government of national unity between Hamas and its main rival Fatah in March 2007. Three months later Hamas initiated a violent assault against the structures of its Fatah rivals in Gaza and forcibly took control of the Strip, triggering a response that led to the closure of the border, the imposition of crippling sanctions, a blockade by sea, a brutal 22-day bloodbath eighteen months later when the IDF killed up to 1,400 civilians and five years of insufferable misery for the 1.7 million inhabitants of this tiny piece of land, now almost completely isolated from the rest of the world. Of course the misery does not only come from outside, for Hamas advocates a conservative form of Islam which has severely limited the freedom of women in Gaza, with the "Morality Police" also enforcing harsh restrictions on speech, public expression or any sign of dissent against the Hamas regime. With their lives destroyed by the blockade, their homes and families reduced to rubble by the IDF, and the tattered remains of their own personal freedoms being increasingly ripped apart by Hamas, it is impossible for us to try and imagine what life is like for those for whom Gaza is the only home they will ever know, or would want to know, but the Guardian made an effort yesterday with a liveblog from Gaza capturing the everyday thoughts, fears and hopes of some of its people. 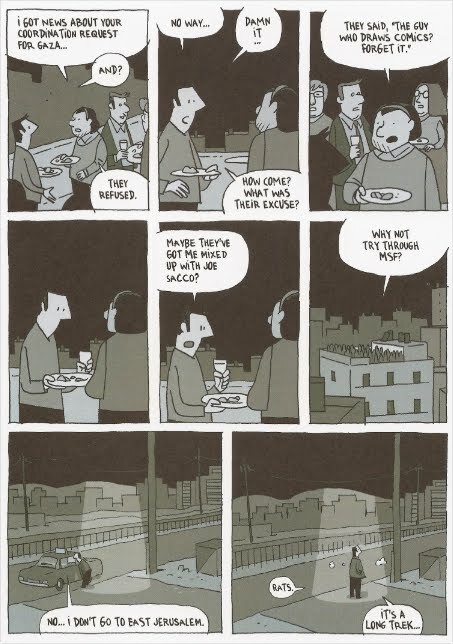 In parallel to that I spent part of yesterday reading Guy Delisle's latest graphic chronicle Jerusalem. Delisle is a cartoonist and animator from Quebec who has produced a series of illustrated travelogues documenting his time in unusual locations overseeing animation projects in Shenzhen and Pyongyang, and accompanying his wife (who works with Médecins Sans Frontières) to Burma and most recently Jerusalem, as she worked on a project in Gaza. Taking an apartment in Palestinian East Jerusalem they lived there for a year that included the 22-day assault on Gaza by the IDF, and the book illustrates his everyday life as he comes to know the city and its occupants. Delisle's style, as anyone who has read his previous books, is quite different to more investigative cartoonists, like Joe Sacco (whom Delisle wonders if he's being confused with when his requests for permission to travel into Gaza are continuously rebuffed) whose work is a matter of serious reportage. Delisle just documents what is happening around him, some days it is a conversation with someone whose house is about to be raised by the IDF, others it's simply his quest to find a park for his children to play in. His book is a simple and honest account of someone living a sometimes mundane life in an extraordinary environment, yet because of this simplicity it remains deeply moving nonetheless. Sacco, on the other hand, has written two books that are best described as harrowing. In Palestine he documents his travels around the scattered territories in 1991 and 1992, viewing his role as that of an eyewitness to the life-stories of those he encounters. A decade later he returned to Gaza to investigate two IDF massacres, in Khan Yunis and Rafah in 1956, to capture conversations with eyewitnesses before they are lost to history. These are documented in Footnotes in Gaza, which also gives a good overview of the hardships of life in Gaza before the Hamas takeover. Life, it seems, has never been easy in Gaza. But we owe it to those trapped there to try and understand it a little bit better. @Phil - yeah, all of Sacco's reportage stuff is pretty intense. I think I found Safe Area harder going than Footnotes, maybe because I lived through the events of Safe Area and the stuff being recounted in Footnotes dates from the 1950's - but its still pretty harrowing all the same. On the other hand Jerusalem is definitely the hardest going of Delisle's books, maybe because his others are just talking about the oddities of places none of us are very familiar with, wheras with Jerusalem its both a situation we are aware of, and the hardships and suffering he witnesses are far more intense than those of folks in Shenzen or Burma - although he does find time to hang out on the beach, do some sight-seeing etc, its not as relentlessly hard-going as Sacco's stuff.